This is an interview with Julie Fernandez, who knew before her yoga teacher training was over that she wanted to bring healing to young people through yoga. Through a few non-profit organizations in New York City, she started working with at-risk teenage girls and youth in trauma. Julie went on to work with the nonprofit Exhale to Inhale (ETI), teaching yoga at domestic violence shelters to empower women survivors of domestic violence and sexual assault. Last year she moved to California and began working with a psychiatrist, helping to bring healing to his patients through breath work and yoga. She serves as ETI’s Program Manager for Southern California. I was initially motivated to do this work when I saw the impact it had on me, a survivor of sexual assault, and I could no longer bear the idea of children and youth suffering in the ways that I did. I spent my entire adolescence suffering from depression, complex trauma, abuse, and eating disorders, as well as the accompaniments, including shame, self-loathing, and feeling stuck in a body that I felt could not ever serve me. I decided I certainly had to try to relieve some of the pain of hurting children and youth, and provide a small piece of hope. To see a sense of peace and calm on the student’s faces and body language. To see them believe in themselves again and find hope for their own recovery and healing. When students return, that’s a clear sign that things are shifting for them. My students have taught me resiliency. When they walk through the door, they exhibit courage, strength, and willingness. They are a constant reminder of our capacity to overcome our challenges. In what ways do you think yoga addresses some of the societal factors at play in the institution or population you work with? Unfortunately, domestic violence survivors are not only left with physical and emotional damage, but are also faced with a plethora of societal challenges. These include socio-economic disadvantages, poor housing, discrimination, and a lack of social support, which often leads to more mental and physical health issues. Yoga has been proven to reduce many of the symptoms of trauma, including anxiety and depression, and to help people become healthier and stronger. What, in your mind, is the relationship between a practice of mindfulness, and greater social change? Mindfulness allows us to be fully present and bring awareness to our thoughts, feelings, and sensations, as well as to what is happening outside our bodies all around us. So much about yoga is learning how to respond, rather than react; it teaches us to pause and bring awareness to any situation. Mindfulness increases our capacity to empathize and connect with others; this connection is the foundation of social change. What advice would you give to someone who is going to teach in the shelters in which you work? What would be the most important thing for them to carry? My advice for anyone who is going to teach in shelters or communities of trauma survivors is self-care first. It is so important to take care of yourself, so that you are fully equipped to help others, and give them the 100% that they deserve. And for those of us who are survivors ourselves, I urge them to get the support they need—whether through a community or therapist —so that they work on their own healing to avoid being triggered themselves. Finally, we must be mindful, and open to feedback. 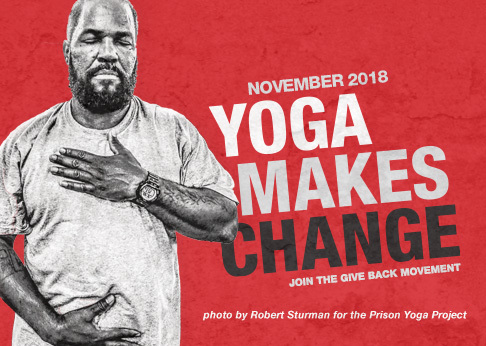 I hope that it continues to be more accepted as a tool for healing, and that there will be more access to free yoga for those who cannot afford it.